This will be the first project in my new book*, The Forgotten Realm of Gothic Woodworking, which will feature not only projects with which to outfit your manor, but will answer age-old questions about the period such as: "Did they buy black nail polish or make their own?" and "Does this flying buttress make me look fat?" I'm all up in the Goth grill these days and have been finding loads of fun projects online, thanks in part to those of you who have commented on the last couple blog posts and those who have emailed me directly. You might be wondering what the difference is between Gothic, Medieval, and Renaissance. According to Wiki, the Medieval Period is from 400 - 1500; Gothic (a pejorative term meaning barbarous or crude) is from 1150 - 1500; and Renaissance is from 1300 - 1600. I'm currently reading The Time Traveler's Guide to Medieval England: A Handbook for Visitors to the Fourteenth Century, by Ian Mortimer, which is wildly interesting. It recounts a time when mullets didn't make you cringe. As you read the book, you can't help but wonder where you would fit into the social hierarchy—royalty, knight, merchant, peasant, mead-swilling friar—and be forever grateful that you're living in the 21st century. The 14th century doesn't have indoor plumbing and Barbie Foosball. I don't want to live in that world. The book is what got me interested in researching the types of furniture that were made back then. 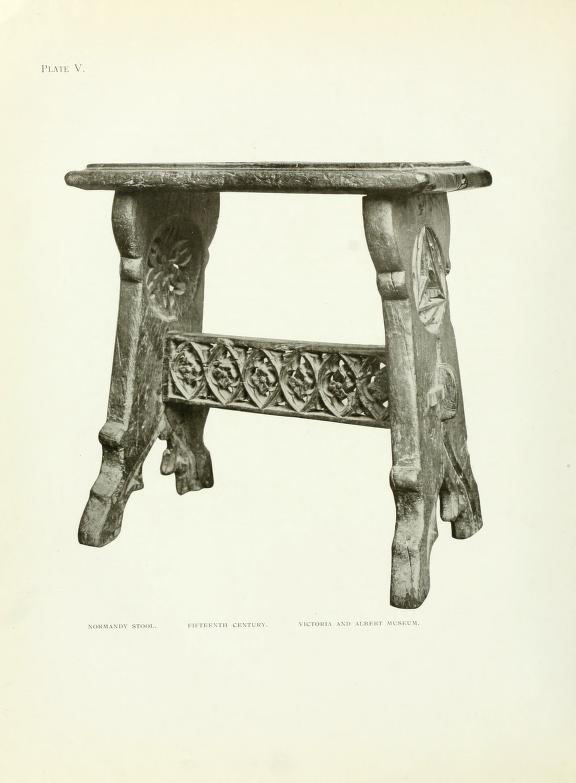 One piece that caught my eye is a 15th century stool from Normandy. I found it in a free book online. My version will be a little different, but the basic design is the same. The stool had me at tusk tenons. Before tastes in furniture starting changing in the 17th century, much of the furniture was adorned with elaborate carving. Google “gothic furniture” and you’ll see what I mean. So, this weekend I’ll get started building my collapsible stool and hope that no one drops by unexpectedly. Perhaps there’s still time to build a moat around my shop. An interesting write-up on 15th and 16th century stools can be found here. *I'm not really writing a book about gothic furniture. I cant wait to read more. I just came across a highly adorned side table design that I thought was Gothic based on the pointed arches under the apron. Ill build it out of walnut. Will be looking for some pictures of your table. I look forward to seeing your Gothic work. As to definitions of historical eras, well, the dates are somewhat arbitrary. They're different from region to region, too. Some would say the Middle Ages in England went all the way to 1400, for example. Hey, this sounds like fun, Kari. I look forward to more of your work and wit. Cool project & research, Kari. Are you writing a book? Literaryworkshop, yeah, I figured the dates might be debatable. I'm a newbie to all this, so I'm at the mercy of the sites and books I'm reading. I appreciate those in the know setting me straight. Thanks, Autumn. It will be good to be in the shop again! Dyami, there is no book, actually. It was just a way for me to be able use the term "flying buttress." For a while now, I have wondered if this (write a book) were something you were of the mind to do. Evidence of your abilities abound via this blog and I, for one, have no doubt your book will only give further proof to them. Now, as someone whose delayed gratification tolerance is next to nil, is there an estimated publishing date? No pressure, honest. Abi, I was just joking about the book on gothic furniture, but I would like to write a book someday. Just not sure what to write about. It's still percolating in my little pea brain. There are pictures of a similar stool carved by Wayne Barton in one of his chip carving books. Sorry, I don't have the title with me now. Anon, you are correct! I just looked at Wayne's design book and he reproduced this exact same stool. His chip carving was different, but the shape is the same. Thanks for letting me know. I'm pretty sure I'd be a serving wench. I can't wait to see your pre early modern pieces! I've never played "Foosball", but that Barbie version looked awesome! Awesome I say! Now I just have to save up the 25 large. Giggidy. Two images went thru my mind: Kari dressed up as a goth (e.g. black eye shadow/liner, black finger nails), and Megan dressed up like a serving wench :). Megan, the wenches got to wear the coolest outfits! Bob, a world without Barbie Foosball is barbaric indeed. Glad you found my little essay on Gothic benches of interest. Regarding that supposed 15th c Norman stool: It is in the collection of the V&A, in storage (not on public display). On a trip to London a couple years ago, Nick Humphrey kindly retreived it and allowed me to fondle it a bit. Close observation revealed some odd things that make me wonder about its origin. If you're interested I can forward you some of the observations and speculations I made. Tim, thank you for all the help. I just sent you an email.